1 from the Latin exopto, are, avi, atum. To desire eagerly, long for. 2 winery founded in 2003 by Tom Puyaubert in La Rioja. It is fascinating that more often than one may care to count, a winemaker comes across a way to make a new wine quite by accident. Not all accidents in the vineyard or winery are happy ones, but in Tom’s case two such accidents led to very happy results. Tom, born in Bordeaux, has now lived in Spain for fifteen years, even though his original intent was to complete his studies in international business within six months. In order to support himself while there he engaged with a French oak-barrel maker, Saury, to sell its products in Spain. However, he fell in love with the region and its wine-producing potential and decided to pursue his dream of making his own wine there. He had already had experience working for wineries in the United States and France. In fact, when he was but 20 years old Tom had decided not to go to California, as so many European hopefuls who wanted to become winemakers did, because he felt he’d gain more and learn more by working for a small, family-owned winery than for a California behemoth. He chose Virginia and worked for Rockbridge Vineyard in the Shenandoah Valley for four months where became adept in all aspects of winegrowing and winemaking, picking up Spanish while working in the vineyard with the Mexican workers. 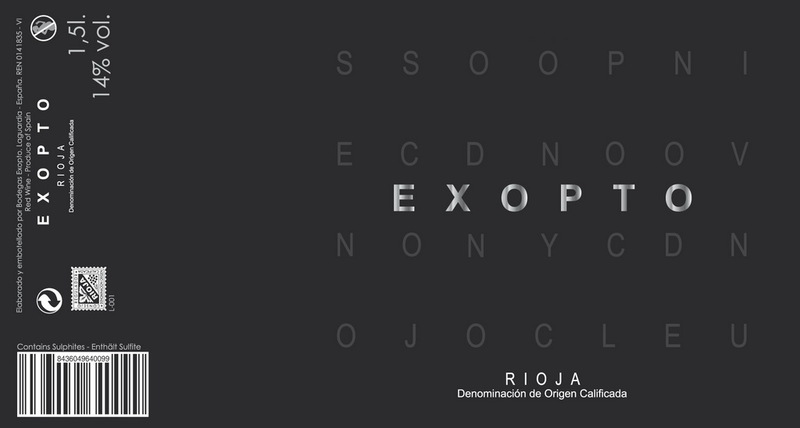 Bodegas Exopto is one of the many new wineries in Rioja that is breaking new ground with new ideas, new attitudes, and new technology. There are still many traditionalist die-hards (and long may they live) such as Marqués de Murrieta, López Herredia, and others that will continue to produce their wines using American oak, aging the wines—both red and white—for long periods, and then delaying their release in bottle until they are deemed ready to consume. Very deep pockets are needed in order to do this. This has long been a recipe for making great wine in Rioja, but it is slowly yielding to the global advances in technology and new ideas. Exopto, founded in 2003, is at the cutting edge of the new in all respects. 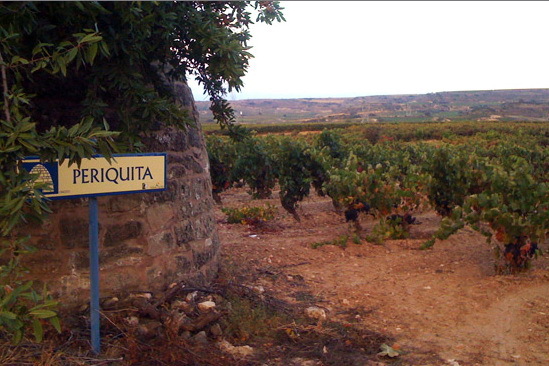 An important point to grasp about Rioja is rooted in its history as a wine region. Wine had been made there for many generations and its consumption was largely local. For the most part it was sold in cask and very little of it was bottled. This was radically changed by the arrival of many Bordelaise winemakers who fled to Spain when phylloxera devastated the vineyards of Bordeaux. 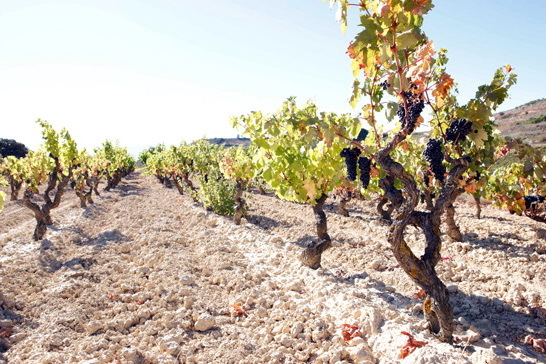 The French purchased grapes from the growers, established many new wineries or worked for existing ones, and changed the nature of Rioja wine, but they also helped create a divide between the winegrowers and the winemakers. There are now 500 wineries and 15,000 vineyards. Tom wanted to do things differently, which meant that he would lease his vineyards but also have a winery to make wine from his own fruit. In this way he could control everything. He is a genuine terroirist and garagiste, which is to say vineyard manager and winemaker, as well as part owner. Nonetheless, all of his wines conform to the regulations of the Rioja Consejo de Denominación de Origen Calificada (D.O.Ca.). Location: Abalos, altitude of 200 meters. Soil: gravel with sandy subsoil. Special features: due to its orientation and soils this vineyard produces some very mature and fruity Tempranillos. Location: Abalos, altitude of 600 meters. Soil: gravel with sand subsoil. Special features: very old vines situated on land in part of the village. An air current often blows through this parcel lying at the foot of the Sierra Cantabria Mountains. However, its stony ground allows the heat of the day to be absorbed. This results in grapes that are well-balanced and complex with great freshness. Location: Abalos, altitude of 400 meters. Special features: vineyard of very old vines (60 years old) with an extremely limited yield (1kg/per vine) producing some highly concentrated wines with excellent structure. 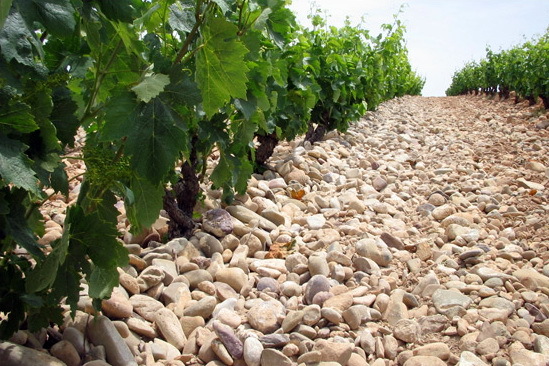 Special features: the particular feature of this slope with very good sun exposure is the presence of a subterranean river that borders the vineyard. This cool atmosphere ensures that some very well-balanced, complex grapes are obtained which always maintain very good acidity. 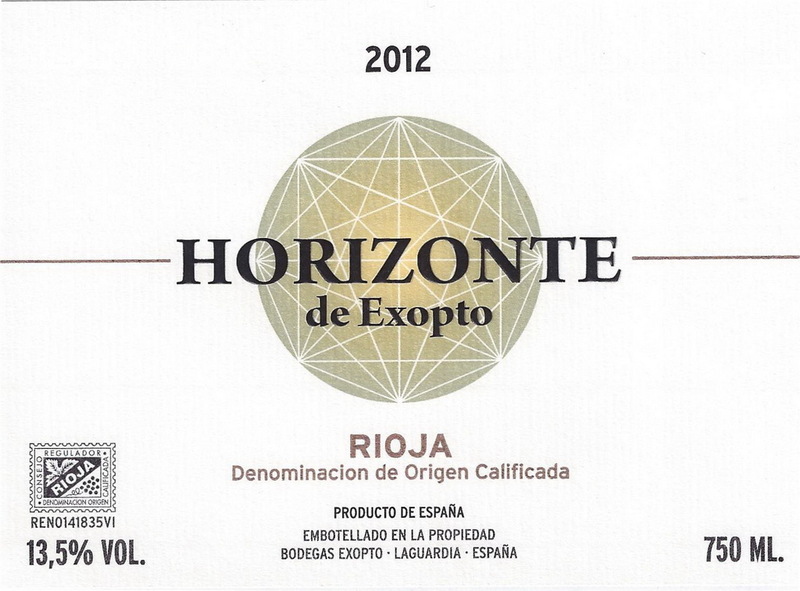 Wine: Horizonte, Exopto / Parte Alta. Location: Alfaro – Monte Yerga, altitude of 500 meters. Special features: a Graciano “micro-parcel” with very good orientation that allows the grapes to ripen gradually. A river running in the subsoil regulates maturity in extremely hot conditions. Location: Alfaro – Monte Yerga, altitude of 500 metres. Special features: an old Garnacha parcel (60 years old) that enjoys a Mediterranean influence especially favourable for perfect maturity. The altitude allows good acidity to be obtained and vigour on the palate. As can be seen from the pictures above, all the vines are gobelet-trained (called en vaso in Spain, and also referred to as bush vines). The vines must be managed manually and hand-harvested. There is something extremely satisfying about finding a winery Website that provides such complete information about its vineyards, for very few provide it. Eighty percent of his production is exported abroad. It is difficult, as a newcomer, to break into the highly competitive markets for wine in countries like France, Germany, England, or Spain itself. He’s had much more success selling his wine in Mexico, Canada, Brazil, Australia, Singapore, and now in the United States, thanks to Patrick Mata and Olé Imports. 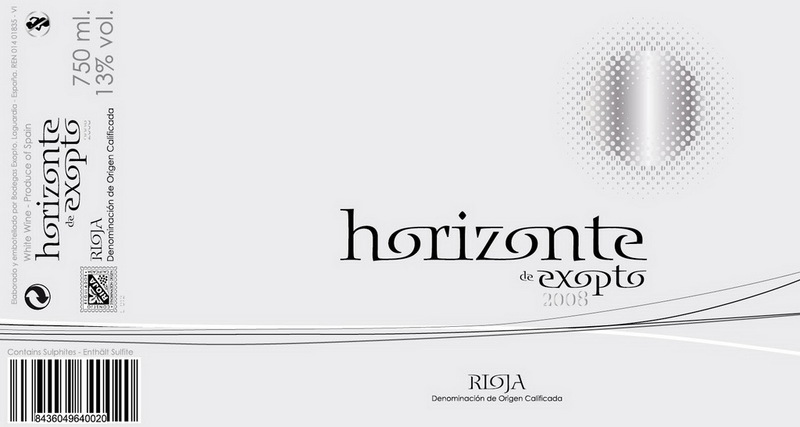 In fact, Olé has been importing his wines to the U.S. since 2006, beginning with his 2004 Horizonte. He now sells about half of his total production here. 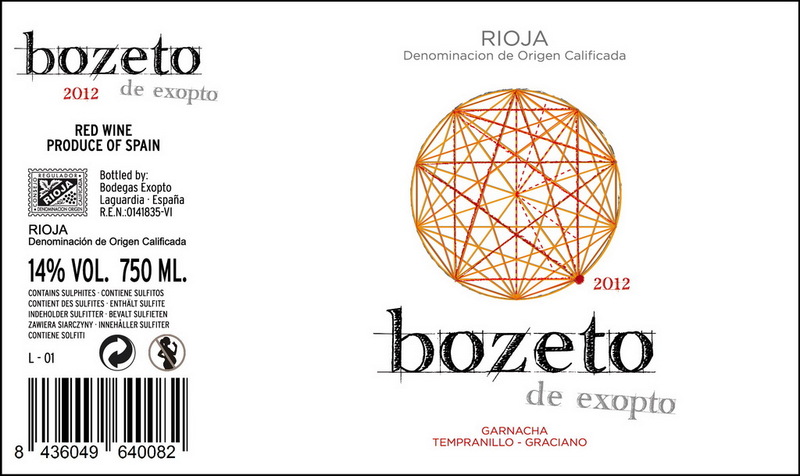 His most popular and affordable wine is the Bozeto (formerly known as “Big Bang”), made of 50% Garnacha, 40% Tempranillo, and 10% Graciano, made from organically and sustainably-grown vines that were planted in 1980. The 2012 is still young but very approachable. It has a nearly opaque purple core in the glass with a very narrow meniscus, and its nose is of medium intensity, redolent of red and black berries, and briefly manifests notes of sardines when first opened, but that vanishes as it breathes and peppery notes come forward. (In fact, I’d give it an hour to air before serving it so that it can really open up.) In the mouth it shows a lifted acidity and medium to full body with nicely-balanced tannins; very fruit-forward—dominated the berry flavors—with notes of licorice, especially in the finish. It has gotten 90+ points from Robert Parker over several vintages. I’d call it a perfect barbecue wine and the price is also right at $15 retail. The Horizonte Tinto is another wine that is exceptionally good and available at a very reasonable price, but there is so little of it that most of it can only be found in restaurants. Still, a wine that earns scores of 90 plus consistently is one to which we should all pay attention. This red wine stands out by being a blend that reflects Rioja tradition, while the growing and making of it is other than traditional. 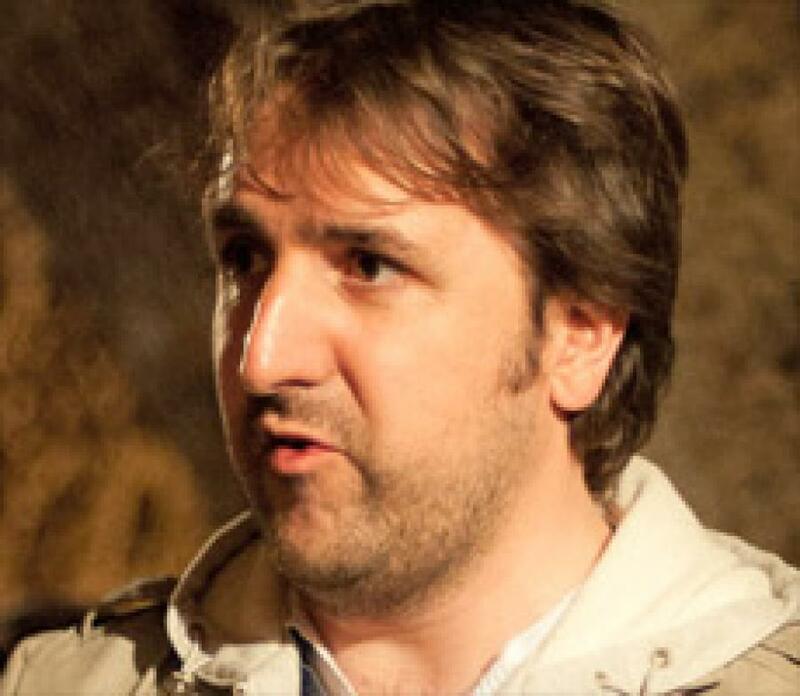 As with his other wines, Tom’s approach is very rigorous, with an almost fanatical attention to details. When the grapes are brought into the tiny winery 70% are destemmed and the balance is lightly crushed. All are then macerated for four days at 5° Celsius (41° F.) before being transferred to concrete tanks for fermentation with the native yeasts that live on the skins. Post-fermentation the wine then spends another twenty days of maceration in contact with the skins, which impart yet more color, tannin, and flavor. The wine is then placed in highly-toasted barrels, 80% of which are made by Saury, a famous oak cooperage in France for which Tom is the representative in Spain. The other 20% are made of American oak—a nod to another tradition in Rioja, the use of American oak from the Appalachians However, beginning with the 2011 vintage, Tom only uses French oak, which in his opinion seems better suited to Rioja wines as what it imparts lends more elegance and subtlety to the wine. One third of all the barrels are new, another third are one year old, and the balance is two years old. The result is wine that after a year in toasted wood has acquired a smoky aroma and tobacco notes, while the fruit is expressed as black fruit—cherry and berry alike, and a hint of licorice in the finish. This is a wine that can be drunk now but should continue to evolve for a few years. Pretty remarkable for only $32. For Tom, the use of new oak is akin to using salt to season food. Too much salt and the dish is ruined, too little and it lacks flavor. So it is with new oak; its use must be judicious and balanced. As a matter of fact, one could say that Tom is a master of oak usage, given that he also works for a cooperage. 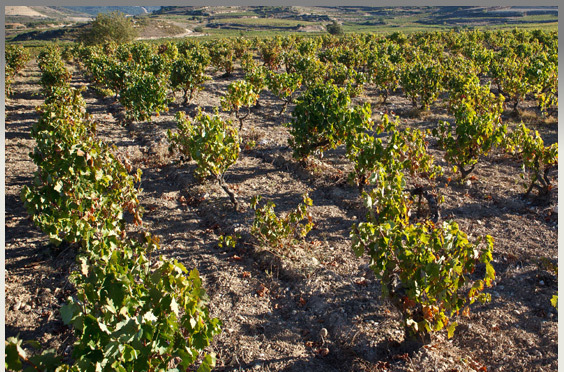 The Exopto is made of 60% Graciano, which is almost unique among the wines produced in Rioja. In the first place, there are only 1,000 hectares (2,500 acres) planted in all of Rioja; his plot of Graciano is a mere half-acre. Furthermore, it is a wine that is only made in good years, as is the case with the 2010. Graciano is a difficult grape to grow and really needs ideal conditions in order to develop and mature properly with ample exposure to sunlight, else it will be far too acidic and green. 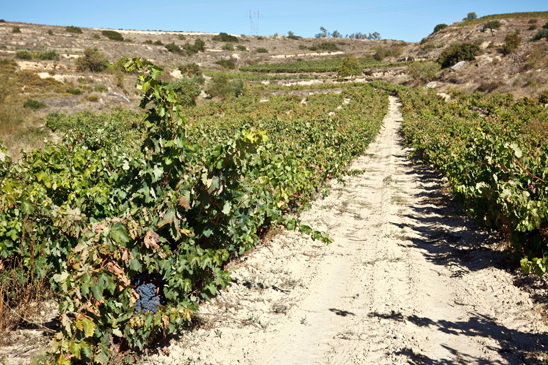 As a result, given that most growers are looking for quantity more than quality, Graciano has been pulled and replaced with more productive vines like Tempranillo. The thing about Graciano, as Tom discovered in 2005 quite by accident, is that it is the variety that must be picked last in the season, so that the acidity is brought more in balance, sugars have time to build up, and over-ripeness is the key. In years that are too cool, like 2008 and 2013, no wine is made as the fruit will not adequately mature in such a condition. In a year like 2010, when the conditions were just right, he bottled the Exopto, producing just a few dozen cases. This is a very big wine, presenting itself with a purple opacity in the glass that cues you to what lies ahead. At four years this is still a young wine as is apparent from the color and nose, which is pungent with aromas of blackberry, graphite, black coffee, and minerals. In the mouth it feels huge, with its bracing acidity, firm tannins, and black fruit, along with a long, lingering finish. Still youthful, it needs about five years before it will ready to drink, and could be held in a proper cellar for decades more, thanks to its 60% Graciano, blended with 30% Tempranillo and 10% Garnacha. It earned 94 points in Wine Spectator. With only 342 cases produced it is indeed a very rare wine, yet its price for the quality is very reasonable at about $70 retail, but it is mostly sold in restaurants. 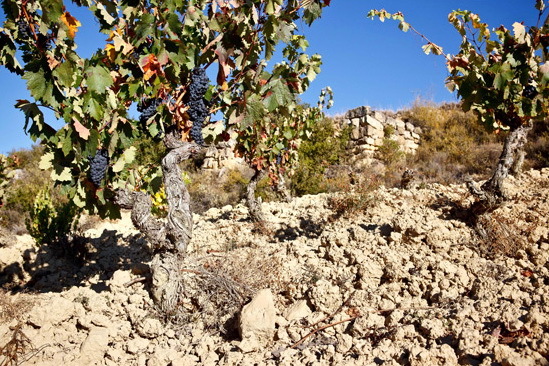 Mazuelo, a variety often used in Rioja red blends (usually with Tempranillo and Graciano), is the one traditional variety entirely absent in Tom’s wines. Viura is another challenging variety. Usually, by itself, it produces a rather neutral and uninteresting wine. A handful of producers make some remarkable white wines dominated by Viura that have been aged in oak barrels for ten years, such as López Heredia’s Viña Tondonia White Grand Reserve 2009. These are very big and rather expensive wines, but then López Heredia is among the greatest and most traditional of wineries and one of the few to own its vineyards. For Tom, the discovery that Viura benefited from long contact with wood was a personal epiphany. One year in mostly neutral oak was all that it took for him to create a Viura-based white that was far from ordinary, though not at all like a Viña Tondonia either. Tom makes the Horizonte Blanco with great care. Once the Viura is picked it is first fermented in stainless-steel vats so that the temperature can be controlled. As the fermentation begins to slow down the must is transferred to oak barrels to complete the fermentation. The barrels are not racked but rather the wine is kept on its lees, which at the beginning undergo battonage once a week, later every two weeks, and finally once a month. It is done using a system of special rollers that support the barrels and allow them to be rotated rather easily by hand. No baton is used for these lees. The same is done for all his wines. The resulting wine is bright, with at first a nose offering stone fruit and citrus, but as it evolves in the glass it begins to yield a floral bouquet of considerable intensity. It offered a long, minerally finish that was refreshing and very satisfying. It is certainly ready to drink now but could continue to age in bottle for another several years. Only 1,800 bottles were made. All this for a mere $32. These are wines that represent an interesting spectrum, from the quaffable, barbecue-friendly Bozeto, to the more refined character of the two Horizontes, to the powerful and elegant Exopto, all the product of a master crafter of wine from one of the great vinicultural and oenological regions of the world. It is not by accident. This entry was posted in Vineyards, Vinification, Viticulture, Wine importers and tagged Exopto, Ole Imports, Rioja wine, Tom Puyaubert on 25 June 2014 by JoseM-L.